Games OS is a known name in iGaming. This company has created many popular casino machines. One of these games is Farm Slot. This is a title centred on, as the name implies, agricultural life. If you’re a fan of living in a village or a homestead, further away from the hustle and bustle of the busy cities, then the chances are that you will love the atmosphere of this game. The music is very fun to listen to, too. However – the music can get boring after a while. If you too feel this way, then you can turn the music off in the settings. 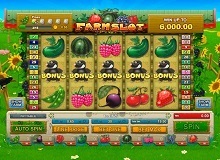 Farm Slot features 30 pay lines on 5 different reels. If you want to learn more about how to play and beat this game – you’ve come to the right place. Be sure to learn more about this play by reading the paragraphs below. As is the case with all of the other casino games – in order to play Farm Slot machine online you will need to select your bet first. And there are different coin denominations you could use for this. The smallest coin to be used is 0.05. The biggest coin is 5. So, the maximum bet in this casino machine can go all the way up to 150 coins. There are a few special features that players love about this title. First of all, you can win a number of free spins. If you get at least three watering jar symbols during one spin, then you will get some free spins. If you get three watering jars – then you will get 7 free spins. If you get 4 – you will get 15 free spins. 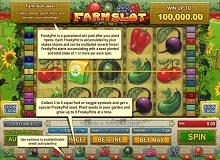 If you get 5 – you get 25 free spins at Farm Slot. Then there are the bonus games. First of all, if you collect 3 or more moles on a single spin – you get access to the bonus round. This is the whac-a-mole bonus round. You’ll have to hit the moles on the 9 different fields that will become available to you. The more you hit, the bigger the rewards you’ll claim. Aside from all that, you can even build your own homestead in the pokie. This is a side-quest aside from the main round. The more money you win in your main game – the bigger the plants will grow in your garden. And you’ll get more rewards. A potentially bad thing in this title is that it doesn’t feature a Wild symbol. The Wild symbol is a staple in many of the most popular casino games. 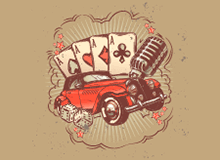 However, if you manage to use the Farm casino slot online bonuses – you can win a lot of money. Also, you can use the auto spin feature in order to automatize the pokie. You can set the number of spins that the game will play out on its own. And you can relax in the background. There are also the options to select the minimum and the maximum bets with a single click. And if you’re lucky enough, you can win the 5,000 coins jackpot by getting 5 symbols of strawberries on any given spin. The RTP rate in Farm Slot is 95.77%. If you wish to play Farm for real money, then you should definitely consider the RTP rate. 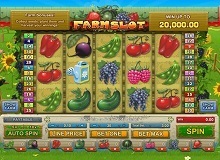 However, you can also decide to play Farm slot machine online for free. That’s right, there are Farm Slot free versions that you can use in order to see what the game’s all about. Farm Slot is definitely a game that you should consider playing. This goes especially if you’re a fan of unique slots with special features. The fact that you can create a garden in this play and win prizes for it makes it worthwhile. Aside from that, the Farm Slot game also oozes with charm. The fans of the simple life in nature will love this title. So, we recommend that you give this online casino machine a try. There are many great features that players will come to enjoy while playing this machine. We hope that you will do so too.